One of the most common questions asked is, who owns UK National Debt? Often people assume that UK government debt is owned by foreign investors. However, foreign investors only hold about 25-30% of UK government debt. The rest is held by the UK private sector (pension funds, insurance companies e.t.c). Recently, the Bank of England has also been purchasing Gilts under the Asset Purchase Scheme. 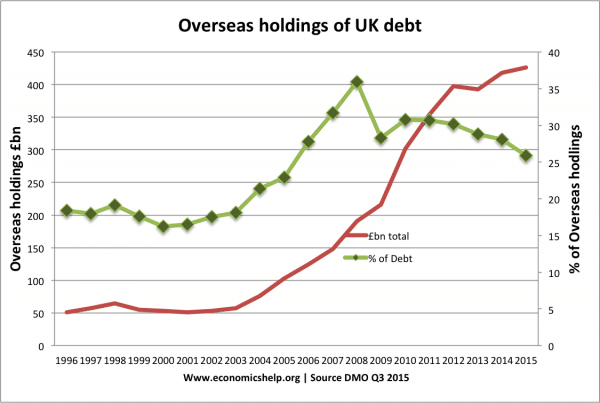 In the past few years, the proportion of UK government debt held by overseas investors has been about 30%. A different, but similar, concept is external debt. This is the total amount of UK debt (both private sector and public sector) held by overseas agents. Source: UK DMO | Blog who does the UK owe money to? See also: Who owns UK debt? Who are these overseas investors? Foreign investment trusts / pension funds. Foreign individuals who want to buy UK gilts. What is the attraction of UK gilts to foreign investors? UK has a good track record of not defaulting on debt. UK gilts are seen as a secure investment. Therefore, despite low rate of return, people are willing to buy. Since the Eurozone crisis, Eurozone debt has become less attractive. There are greater fears of possible default in Eurozone countries, such as Italy, Spain and Ireland. By contrast, the UK (with a Central Bank willing to buy bonds) there is less fear over a liquidity crisis. The pound Sterling is relatively stable. A big issue for foreign investors is the value of the Pound. If the value of the Pound falls sharply, then their investment will effectively decline in value. Inflation in the UK is slightly higher than other competitors, but generally, inflation is under control and the Pound is reasonably stable. Does it matter if debt is held by overseas investors? It is not necessarily a bad thing, if overseas investors hold UK debt. In a global economy, investment banks, insurance firms want to diversify. Similarly, UK banks / investment trusts will hold gilts / bonds in other countries. If the economy is relatively stable, e.g. inflation is low, debt manageable then investors will be happy to keep buying UK gilts. The fact overseas investors are willing to buy UK bonds could be seen as seal of approval that investors expect a decent return from UK bonds. However, it could be a problem if oversees investors felt that the Pound was going to significantly devalue; if there was a rapid devaluation, overseas investors would probably want to sell UK gilts. This would mean UK bond yields would rise, making it more difficult and expensive to finance UK debt. 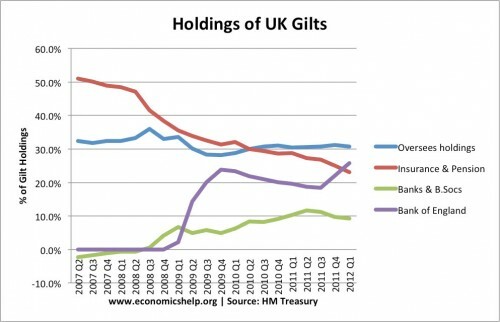 If oversees investors felt that UK could default, then similarly they would want to sell gilts. This widespread selling by oversees investors would reduce the value of sterling and increase bond yields. What this shows is the importance of reassuring foreign investors about the state of the UK economy and value of the Pound. 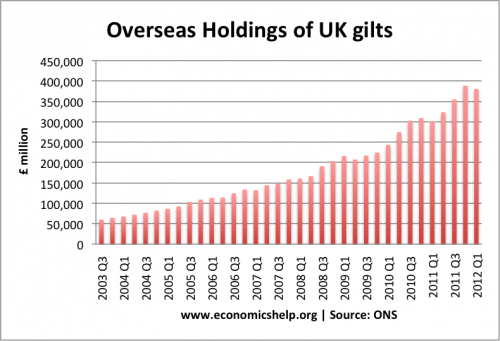 If all foreign investors sold UK gilts, it would be more difficult to finance UK debt from UK domestic private savings. Several European countries experienced difficulties, when foreign investors held significant holdings of government debt. When foreign investors became concerned about the liquidity and solvency of countries like Greece, they sold causing capital flight and rising bond yields. This entry was posted in economics, readers questions and tagged debt, Q.A.. Bookmark the permalink. UK debt is murky – especially the ‘put-through’ purchases of US Ts, done on behalf of China.